It's more than PC culture or "identity politics" — the new "holiday" will help transgender people feel more confident and empowered. You know that feeling of being seen and noticed in a good way? For many people the affirming moment when someone uses your correct name and pronoun is barely noticed. And for others — especially transgender and non-binary folks — it can be a transforming moment of support and affirmation. It can also have a real and positive impact on health and wellness. Just published this month in The Journal of Adolescent Health, Dr. Stephen Russell and colleagues from the University of Texas at Austin found that chosen name use is linked to reduced depressive symptoms, suicidal ideation, and suicidal behavior among transgender youth. Given that, news of the inaugural observance of International Pronouns Day on Wednesday, October 17, 2018 is especially timely and critical. How did such an observance come out? Last spring colleagues Genny Beemyn of University of Massachusetts, Amherst and Shige Sakurai of University of Maryland put out a call for a small number of colleagues from the Consortium of Higher Education Lesbian Gay Bisexual Transgender Resource Professionals to help develop their idea for this initiative. I enthusiastically volunteered to be a part of the group as the LGBT Center at Ithaca College, where I have the privilege of serving as the director, has been working to increase awareness of the needs of transgender and non-binary students, staff and faculty for decades. Once we convened as a team and an executive board was established, we have worked diligently on logistics, resources, and outreach. 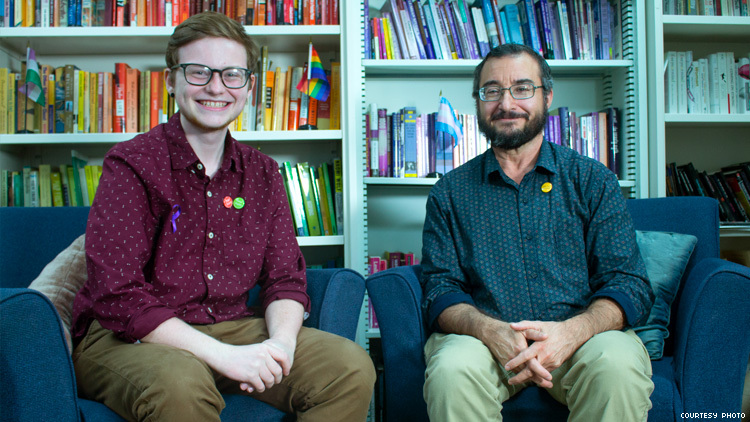 Our Ithaca College LGBT Center student employee, Cal Goodin (pictured above, left, with me), also played a role, deploying skills he developed while interning at The Advocate last semester to collaborate with the team to create Facebook profile frames to recognize the day. Creating an international day to make asking, sharing, and respecting personal pronouns commonplace is one way to extend the efforts and reach of each of our individual offices, and share resources, strategies, and best practices throughout higher education and across communities around the globe. The appeal and reach of our work — that includes not only many colleges and universities but also professional organizations and associations, businesses in the private sector, and care providers — demonstrates the openness and desire for doing more and better around use of pronouns and respect for transgender and non-binary people. Through International Pronouns Day, we want to provide the expertise, tools, and skills to assist folks in doing that. Our activities at Ithaca College will focus on normalizing the asking, sharing and respectful use of each individual’s personal pronouns. We'll foster dialogue in recognizing the privilege and potential risk inherent in asking that one's pronouns be respected. Our campus-based activities will include professional development for staff and faculty and providing resources for the campus community, while others will take on a more lighthearted tone that is affirming, validating, and celebratory. Our social media campaign featuring well-known and esteemed community members extends respect, recognition, and support throughout our campus and beyond. Every table in each of our campus dining halls features information about the observance, and of course, we’ll continue distributing our popular pronoun buttons on campus and throughout our community. In our community, Ithaca Mayor Svante Myrick has signed a proclamation recognizing the day, and organizations and businesses including a health center that serves as a rural haven for transgender health and our local natural foods coop will host events too. Hundreds of groups and individuals from a transgender organization in Italy to a brewery in Virginia have endorsed and registered for International Pronouns Day, including more than 100 college offices and organizations, and professional associations in the education sector such as the Association of American Colleges and Universities, ACPA—College Student Educators International, NASPA Student Affairs Administrators in Higher Education, and the National Association of Diversity Officers in Higher Education. Registrants and endorsers include organizations from more than dozen countries: Australia, Belgium, Canada, India, Ireland, Italy, Netherlands, Philippines, Romania, South Africa, Turkey, United Kingdom, United States including Puerto Rico, and Vietnam. Pronouns are a key issue in transgender communities. Transgender people are harassed and treated with hostility, and people who have non-binary gender identities or who are gender nonconforming experience frequent bias. This is often demonstrated by intentional or repeated use of the wrong pronouns. Anti-transgender violence disproportionately impacts transgender women and femmes of color. This violence must stop. Using the right pronouns is a critical step in acknowledging the humanity of transgender and non-binary people. Intersecting forms of oppression deeply affect transgender communities. These actions are part of larger work creating and sustaining inclusive and supportive communities for people. When we actively welcome and affirm one another and bring our whole selves onto a space, we begin to change parts of the world. For some this may seem like a small act, for others it is a revolutionary demonstration of solidarity, kindness and support that can help transform lives. LUCA MAURER (he/him) is the founding director of Ithaca College’s Center for Lesbian, Gay, Bisexual & Transgender Education, Outreach and Services. Maurer received the American Psychological Association’s Division 44 Distinguished Contribution to Education and Training Award in 2017.